I sat down to read The Vikings after watching the first season of the History Channel's Vikings, having been on a bit of a Viking Age kick lately, and I found it really informative and possibly worthy of a lawsuit. I can't even put into words the number of crazy coincidences between the book and the show, to such a degree that I'm almost positive the History Channel used this book as their reference for making the show (and it seems their ONLY reference), although I can't find anything that links the two. Seriously, after just having seen the show I recognized the most insane similarities: They duplicate almost word for word obscure Viking laws I've never read about before, they discuss a particular artifact and type of stone used for navigation, and use many of the same characters that appear in the show...the book gave descriptions of some historic figures so minutely that I could actually recognize which character on the show it corresponded to before he even gave their names. Sorry History Channel, but Robert Ferguson wrote his book first, so you are busted! Besides that, I enjoyed this history of the Viking Age and was impressed with its scholarship. It is a fairly dense study, covering all the different waves and destinations of Viking "exploration" (I'm a descendant of these guys, so...sorry, Europe!). 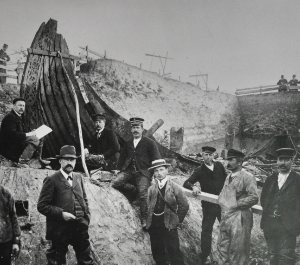 Excavation of the 9th century Oseberg Viking ship in 1904-1905. 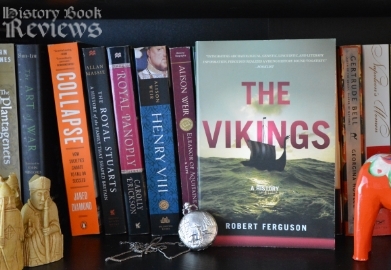 Ferguson's The Vikings is organized primarily by geography, with each chapter focusing on a different part of the world that the Vikings, um, colonized (again...sorry, Europe). This was kind of disorienting for me because it was not chronological at all, and I had a hard time keeping up with who belonged to what century and how all the figures were related. Ferguson discusses the Vikings in Iceland, Greenland and North America, France, the Baltic, Orkney, Scotland, Ireland, England, and even the Middle East. He gives many interesting facts about each of these that makes those distant people seem more recognizable to us. In England, where the Vikings eventually settled, we learn that the 8th century King Aethelred of Northumbria was rebuked like a naughty child for wanting to copy the Vikings' hairstyles. In the Slavic regions there was a leader who was part Viking and part Slav, and he wanted to convert. He considered every main religion and liked Islam, but was turned off by the prohibition against drinking wine. Apparently he said "Drinking is the joy of the Rus. We cannot exist without that pleasure." (130) Yep, that sounds like just about every Swede and every Slav I've ever met! I do have several criticisms of this book. On the front cover the book is promoted as combining archaeological, genetic, linguistic, and literary information, but all in all this is mainly a literary study. There are a few mentions here and there of genetic studies or linguistic analyses, but they are few and far between. There is not a lot of archaeological material referenced, and of the material he DOES mention, about 95% (my very exact calculation) of it was from excavations pre-1960. So there is not a lot of new scientific evidence incorporated, even though there has been so much research in the last decades. Ferguson tells the history primarily through the literature, the Sagas and skaldic poems, which at times can feel a little boring and mythological instead of historical. My other main issue was that Ferguson, throughout the entire book, calls the Vikings "heathens". At first I thought he was saying it as if from the perspective of the Christians that encountered the Vikings, but by the end of the book I became pretty sure that it was just Ferguson saying it. I'm not sure if he meant it to be derogatory or not, but I thought it sounded kind of judgmental and closed-minded. Overall this book had a lot of good information and had a lot of interesting sections, but it had a hard time holding my attention consistently. It felt a little disorganized to me, and a little blah. But it was fun to learn more about my distant ancestors, those wily bastards who, just to gain entry into a walled town, would convert to Christianity, pretend to die, have a funeral procession in the city, and then leap out of their coffins to start fighting. They may have been brutal but hey, at least they were creative! On a different note, while reading the chapter in this book about Vikings in Islamic territory, I had an incredible thought...Vikings vs. Isis! Vikings may have killed a lot of people, but they never practiced whole-scale destruction of physical history, and hearing about all the history Isis is destroying right now makes me beyond furious. So rise up, Scandinavia! You have been neutral and peaceful for long enough, let's bring out the Vikings in you! Viking Age figurine of the Norse goddess Freya.